Easily and efficiently prepare baked goods like muffins and cupcakes with this 12 cup non-stick carbon steel 3.5 oz. muffin / cupcake pan. This pan has a carbon steel construction that resists rust and corrosion. It also provides excellent heat distribution for evenly baked and perfect products every time! The non-stick glaze allows for easy release of your baked goods, helping you save time and money by making cleanup a breeze. Good budget pan with a nice weight to it. Pretty comparable to my current pans. The only drawback is that there is no handles/extra edge on the edge of the pan which can sometimes make it difficult to take cupcakes in and out of the oven without damaging them. This muffin pan has a great non-stick coating, and cleans very easily. I still use a cooking spray to ensure everything releases easily, but it would probably work well without. I have been using it for a year, and have not had any issues. These pans are Great! Good price for muffin pans. It's easy to wash and it really is non stick. I am definitely purchasing more in the future. These muffin pans are a great deal! They bake wonderfully, and cleaning is a breeze. Just let them soak a few minutes and everything just wipes right out! Good standard sized muffin tin. I used the bottom of it to make little tartlet cups. Things brown pretty fast in it since it's darker metal so watch out. This carbon steel muffin pan is relatively heavy duty, and clean up easily. I love the non-stick surface, but I do use a spray release to ensure there is no sticking. I have been putting this pan though the dishwasher, and have not had any degradation of the non-stick surface yet. Perfect for at home baking! Standard size cupcake pan with non stick makes cleaning a breeze. Buy at least two for home use. Dont forget to buy the paper linings. This is a great muffin tin! Muffins come out with ease and cleanup is a breeze as well. Will definitely be ordering a few more sets. This made an awesome gift for a lover of all things bakery related. Packaged well, made of a good material - durable and machine washable. I bought four of this muffin pans and could not believe how durable yet light this product is. My daughter often bake cupcake or muffin with it. It is also easy to clean. These muffin pans are awesome! In the past, I have had muffin pans with rounded edges on the inside of each hole, which caused my cupcake liners to pop up, and then when I'd drop batter in them, some would tip... annoying! But these have nice straight edges and so the cupcake liner sits down perfectly in them, which means no tipping over when I drop the batter in! Winner! They are also very sturdy and look/feel of great quality. For the amount of time I have been using them now, I am highly impressed with this pan, especially at the great price. I would highly recommend! I use this product to make all my cupcakes..great contaimnent and bakes a perfect batch everytime without burning the bottom of my cupcakes..highly recommend it! Solid muffin pan. Nonstick surface is of very high quality and pan is sturdy and durable. A must have for every bakers cookware set! Order now! I think this is a decent quality pan. I made some cupcakes without papers and they still stuck somewhat despite it being nonstick. Other than that it's a decent weight and thick enough for my purposes. Everyone needs a muffin and cupcake pan, I just bought this for my household one and am loving it so far, no problems or complaints! I've purchased three of these pans now; I really like them. They are non-stick and are quite stout. The bottom of one of the cups did get bent from being hit with a spoon but it was easy to flip it over and pound it back out with a few taps from a wooden spoon handle. I really like this 12 Cup Non-Stick Muffin and Cupcake pan. It gets the job done well, and stands up well when being washed. It feels very high-quality. We use these non stick muffin pan for our daily breakfast muffins. So far so good, baking good muffins ;) they are easy to well. Great pans! We use them for muffins and cupcakes. Very durable, they never warp like some pans do. Non stick and easy to clean and remove baked goods from. I've never had any of the non stick scratch off either, which is really good. Great quality pans! No rust after many washing and air dries. Heavy duty and cupcakes come out baked very evenly. I will order this brand again. Great pan we bake corn muffins every they in these pans they are non stick and the finish product is great. They also clean easy. This is a very good high quality muffin pan. We bake cupcakes in them every week and they never fail. We hand wash these and after a year, they still look brand new! Be careful when baking with them because of their dark color. Reduce your temperatures a bit or what your baking might get burned. Good product! GREAT PRODUCT WE USE THIS ON A DAILY BASIS WHEN MAKING OUR DELICIOUS MUFFINS AND THE CUSTOMERS LOVE THE APPEARANCE AND THE PRICE IS RIGHT FOR THIS PRODUCT. I just received these muffin pans. I can not believe the excellent quality. They are much heavier and better finished than what you will find in your local grocery store or discount store. BEST PANS EVER! We are so pleased with how well they fit in the ovens. They clean beautifully. I wish all our pans were your pans. We will start replacing them as we go. Great when making small orders or if your just baking for your household. The non stick works with or without liners. This pan bakes evenly and cleans up easily as well. 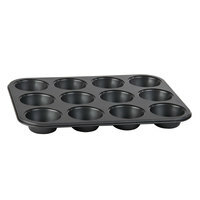 The 12 cup standard muffin pan is simple and easy to clean due to being non-stick. At this great price, buy several so you have no delay when baking. I love this cupcake tin. It makes about medium sized cupcake which is great if you don't want to cut calories. You can buy 2" x 1 1/4" baking cups for this size tin. I love, love, love this muffin pan. My muffins, biscuits and dinner rolls bake up beautifully every time. I lightly oil the cups or spray with non-stick spray. The pan goes through the dishwasher well, however I prefer to hand wash.
Great non-stick pan. Metal is thick and resilient. Very simple to use, with or without paper cups. You can't go wrong with this non-stick pan! I use this for traditional muffins and cupckes, but also for mini souffles and omelets (just make sure to heat and add butter before adding egg mixture so they don't stick). Making a purchase for non-stick pans are one of the greatest purchase i ever made. It makes baking easy and provides exceptional convinience at cleaning up. These pans are great. They do not stick and are easy to move and easy to hold on to. They bake well and do not burn the contents inside.